....There is a need to look inward and realize some unpleasant truths about ourselves as Filipino individuals and as a society. It involves a "shaking of the foundations" or a "rocking of the boat" since it requires us to question our traditional beliefs and values, assumptions or notions. We need to seek an understanding of "why we are what we are, where we can or should be headed," and to therefore be able to formulate ways to attain where we can or should be. The task here is to highlight our weaknesses so that these may in turn be corrected. I believe and think that only through a critical self-analysis or self-examination (ala preparatory to confession some of us learned in Catholic schools) can we change for the better. I am convinced that such an exercise will allow us to pursue truths however shocking and unpleasant they may be. It is only when we have "come of age," when we have come to think for ourselves as an independent people with human dignity, with our own cultural heritage, national pride and sovereignty can we act and work in unity for our own truly, permanent liberation from the dehumanizing conditions imposed by our so-called leadership in government and business and their foreign partners. If we are honestly concerned with our homeland beyond simply wishing for the better or fatalism, if we want fundamental changes to improve in the long-term the human conditions for the majority of our present and future countrymen in the homeland, it behooves us to do such a self-examination. We must look critically at what we are and why, examine the history and nature of our society which must be changed, then determine the direction of those changes. Finally, we must enlist the energies of that majority to effect such changes [facilitated by such knowledge and understanding. In the past, I have posted several essays about our so-called Filipino values (click Fr. Vitaliano Gorospe SJ and Fr. Jaime Bulatao SJ in blog sidebar); and below article is a new find that presents some of our Filipino traits which seem to imply our Filipino outlook/world view on human existence or life, our Weltanschauung, to borrow a fancy term from Marx. In the article, author Prof. Emerita Quito shows us the two possibilities/functions of our so-called Filipino values, I add, in terms of individual or group/community/society/country benefit [for individually selfish benefit or the common good]. Thus, let us appreciate the fact that applied to our majority, i.e. our society, these values have the potential of working for our human upliftment/national betterment; or leading to our predicament (this latter which seems to dominate our society for so, so long). I think and believe where we are and where we are going greatly depend on how much conscious awareness and understanding we have about our traits (as "dictated" by our beliefs and values) and how we act based on such knowledge. Obviously, education beyond "education for jobs" is imperative, i.e. liberal education that aids the development of critical thinking. 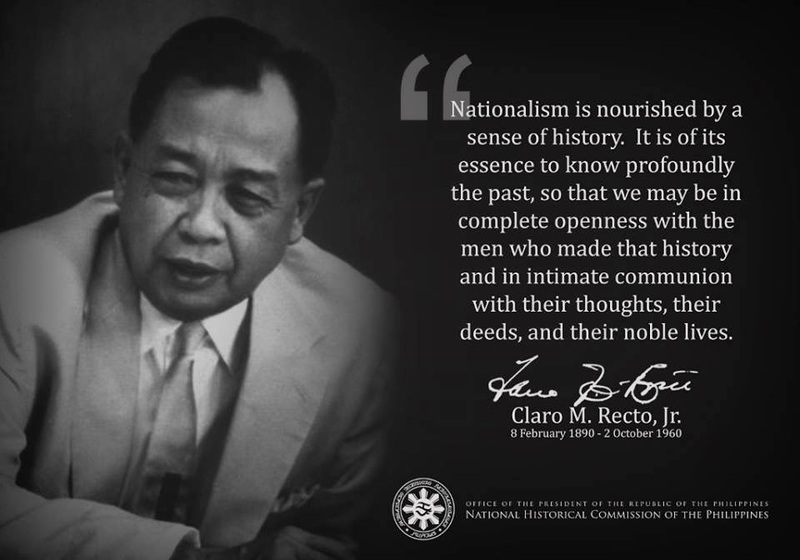 But as any thinking Filipino knows and realizes, education is no absolute guarantee of collective or social consciousness, which in turn can not guarantee acting for the common good. The Filipino has/is witness to so much insatiable, and systemic corruption by our educated fellowmen. However, education is a good start. At the end of the day, I think and believe that we are not born "tabula rasa." We are born with and shaped by nature (our genes/DNA, native IQ - can be improved on) and by our nurturing environment/milieu (our parents/guardians/role models, acquired knowledge from education and experiences). Based on where we have become as supposedly and self-proclaimed Christian people, our highly influential Catholic Church and Catholic/Christian schoolings have failed, have not worked well in instilling an authentic Christian living, i.e emulating Christ for the common good in our homeland. Instead, these religious institutions tend to cater to the children of the rich and powerful; and inadvertently or not, led their followers to practicing "split-level" Christianity despite their proclamation of [and thus, paying lip-service to] "being for the poor." Prof. Quito alluded to us Filipinos as being "other-wordly," which I think and believe is true. Our Filipino-type of Christianity has stressed one of the Beatitudes, i.e. "Blessed are the Poor..;" which is apparently taken literally by these priests, ministers and the masses; and thus play neatly into Marx's dictum " religion as the opium of the people." While many of us Filipinos console ourselves with the thoughts of the afterlife of "heavenly reward" and thus not attending nor exerting time and effort to fixing our socio-economic and political predicaments, our so-called rulers in business, government and military with their foreign partners laugh at us on their way to their banks. Much has been said about so-called negative Filipino traits. They have been blamed for the weak character of the Filipino; they are the culprits, the scapegoat of our failures, or at least, the explanation for lagging behind more successful Asian neighbors. I will use oriental yardsticks to measure success or failure for it would be unfair to use Western standards to evaluate our Filipino traits. For example, is a materially comfortable life with physiological ailments more successful than a materially deprived life without physical ailments? Is the image of Juan Tamad waiting for a guava to fall such a reprehensible, if not scandalous, picture? Is the similar image of Sir Isaac Newton, also resting under a tree, more refreshing? It is very Filipino to stress our minus points, to find fault in our behavior, to compare us unfavorably with Westerners by using Western standards. It is common to hear such names as Bertong Bukol, or Ipeng Pilay or Huseng Ngongo. It seems that we take pleasure in underscoring our weaknesses, faults, defects, etc. Our standards are smallness, averageness, mediocrity; grandeur or grandness is not in the Filipino vocabulary. The West, in contrast, evokes: Alexander the Great, Julius Caesar, Der Führer, Il Duce, El Caudillo, Elizabeth Regina. We seem to enjoy being humble and meek, or what Friedrich Nietzsche called "the morality of slaves." There is something strange in the very way we look upon success. A person is not supposed to exert effort at the expense of sanity. We ridicule a person who teaches himself how to think and label him Tasio, the philosopher. We warn persons not to learn too much lest they be like Jose Rizal who was executed at the Luneta in 1896. Assertiveness is frowned upon because it smacks of pride and ruthlessness. Success to the Filipino, must come naturally; it should not be induced or artificially contrived. One should not be successful at an early age because that would mean exertion and hard work. Success must come very late in life, if it is to come at all. Filipino traits must be understood in the above context. Hence, they are considered negative only according to other yardsticks. The following Filipino traits show an ambivalence of positive and negative aspects. Negative, because it arrests or inhibits one's action. This trait reduces one to smallness or to what Nietzsche calls the "morality of slaves", thus congealing the soul of the Filipino and emasculating him, making him timid, meek and weak. Positive, because, it contributes to peace of mind and lack of stress by not even trying to achieve. Negative, by all standards, because it begins ardently and dies down as soon as it begins. This trait renders one inactive and unable to initiate things or to persevere. Positive, in a way, because it makes a person non-chalant, detached, indifferent, nonplussed should anything go wrong, and hence conducive to peace and tranquillity. Negative, because one closes one's eyes to evils like graft and corruption in order to conserve peace and harmony in a group at the expense of one's comfort. Positive, because one lives for others; peace or lack of dissension is a constant goal. Negative, because it is stubborn and resists all efforts at reconciliation. The trait makes us childish, vindictive, irresponsible, irrational. Actions resulting from this trait are leaving the phone off the hook to get even with one's party line; stopping the engine of the car to prove that one has the right of way; standing one's ground until the opposite party loses its patience. Positive, because it is assign that we know our rights and are not easily cowed into submission. It is occidental in spirit, hence in keeping with Nietzsche's "will to power." Negative, because one leaves everything to chance under the pretext of trusting in Divine providence. This trait is really laziness disguised in religious garb. Positive, because one relies on a superior power rather than on one's own. It is conducive to humility, modesty, and lack of arrogance. Negative, because one disowns responsibility and makes a scapegoat out of someone or something. One is never to blame; one remains lily white and has a ready alibi for failure. Positive, because one can see both sides of the picture and know exactly where a project failed. One will never suffer from guilt or self-recrimination. Negative, because, being closely related to hiya and kasi, it enables a person to shirk responsibility. One is never accountable for anything. Positive, because one's psyche is saved from undue embarrassment, sleepless nights, remorse of conscience. It saves one from accountability or responsibility. This trait enables one to make a graceful exit from guilt instead of facing the music and owning responsibility for an offense. Negative, because one never learns to be on one's own but relies on one's family and relatives. This trait stunts growth and prevents a person from growing on one's own. Generating a life of parasitism, this trait is very non-existential. Blaring music, loud tones are a result of this mentality. We wrongly think that all people like the music we play or the stories we tell. This mentality also makes us consider the world as one vast comfort room. Positive, because one cares for the family and clan; one stands or falls with them. This trait makes a person show concern for the family to which he belongs. Negative, because one constantly postpones action and accomplishes nothing. This aggravates a situation, a problem grows beyond correction, a leak or a small break becomes a gaping hole. This arises from an indolent mentality that a problem will go away by itself. Positive, because one is without stress and tension; one learns to take what comes naturally. Like the Chinese wu-wei, this trait makes one live naturally and without undue artificiality. Negative, because one overlooks moral principles when one is indebted to a person. One who is beholden to another person will do anything to please him, thinking that by doing so he is able to repay a debt. One condones what the other person does and will never censure him for wrongdoing. Positive, because it is a recognition of one's indebtedness. This trait portrays the spirit behind the Filipino saying, "He who does not know how to look to the past will never reach his destination." Negative, because self-centered; one has no regard for others. So long as my family and I are not in need, I do not care about he world. Positive, because one takes care of oneself and one's family: "Blood is thicker than water." At the end of our exposé of the positive and negative aspects of the Filipino psyche, one asks the question: What after all, is its ideal of personality, activity and achievement? Regarding personality, if the ideal is a personality without stress and tension, then Filipino traits contribute to this. The contention is that success necessarily means hypertension, ulcers and sleepless nights. Could there exist a state of success without these physical aberrations? Regarding activity, if the idea is that one should engage in a whirlpool of activity or if the work ethic is workaholism, then the Filipino indeed is in very poor estate. But is this not more of the Occidental or Western concept of activity? In contrast, the Oriental emphasizes conformity with nature; hence, one should never exaggerate or overact. Regarding achievement, if the ideal is that one must achieve an earthly goal, then the Filipino, as a race, will occupy a low rank. But again, is this ideal not more Occidental or Western, according to which one must always set a goal and accomplish it? Setting a goal is not wrong in any culture, but the manner of achieving it which can be questionable. Does one have to expend one's total energy in the pursuit of an ideal which, after all, is a personal, earthly goal? If for the Filipino smallness, meekness, and humility are ideals, could it not be that he is not this-worldly? Could he not perhaps be aiming, consciously or otherwise, at the life in the hereafter where the last will be the first, the weak will be strong, and the small will be great?